A leader in construction services in southern Illinois for more than 40 years. Fall harvest of 2014 has come and gone and is officially in the books. But, now is one of the most crucial phases, which is maintaining your crop in storage. There are many ways and factors to keep from damaging your crop. After all, your hard work during harvest shouldn’t be wasted from improper storage and over-aeration causing over-drying of your crop. At Gateway FS, we always want to ensure that our grain producers are maximizing their crop and getting the most out of their grain payday. There are numerous techniques to prevent improper storage and over-drying and to properly store your crop with precise humidity, temperature, etc. To read and learn more about this crucial phase, click here to read the informative and helpful article written by Randy Holthaus, Growmark’s grain system operations manager, at FarmWeekNow.com. For more information or questions, contact us today to speak with one of our grain specialists and see how you can make sure you’re getting maximum results of your hard-earned crop. We’re more than happy to help and answer any questions or address any concerns that you may have. Many of our building customers depend on us to recommend, design and build the best possible building that will provide protection and security for their storage needs. It’s not responsibility we take lightly and this is exactly why we work directly with Walters Buildings. 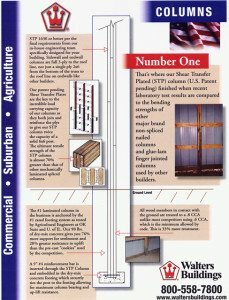 This article takes a closer look at just one of their key building benefits – superior columns. 33% more treatment for wood members in contact with the ground. Plus, when tested by Agricultural Engineers at the University of Illinois, our 90 lbs. dry-mix concrete footing system provided 76% more support for settlement and 28% greater resistance to uplift. Whether your needs are agriculture, commercial or suburban, you can count on FS Construction Services to deliver a structure that will be visually appealing, within budget and built with the highest quality engineering specifications. What that means for you is a strong structure that is built to last. Give us a call at 866-551-3454 and let our specialists help design a structure to meet your needs. And stay tuned for more blog posts on buildings in our “Building You the Best” series! Old man winter is knocking at the door, which means most of us will be spending a lot more time indoors. While spending all this time indoors, whether it’s eating, relaxing or talking with friends and family, you may start noticing a yellow looking ceiling. I have a great and quality product for you incase this occurs in your home. Ceiling White Paint is an incredible white paint with the best features of premium quality, fast drying paint that flows on smoothly and evenly and covers in just one coat without spattering! Its attractive matte flat finish provides an elegant finish that is non-yellowing and durable. The best part is that it’s safe for children’s rooms as well. You can use this product on previously painted and primed plaster, wallboard, drywall and acoustical tile. Surface preparation is also very important to a great looking paint job. Be sure to clean and dry the surface thoroughly, removing all dirt, dust, grease and wax. Scrape off loose paint and wallpaper. Remove glue, shellac and sizing. Plaster cracks and spot prime. Dull the glossy surfaces with a gloss remover or sandpaper. Remove chalky residue and prime unpainted plaster and wallboard with a latex wall primer. Finally, use a stain blocking primer to seal water spots and smoking. The next step is coverage of this paint. When you read on any paint product it typically covers 400 square feet. In a perfect world of painting this might work. It’s best to look at your surface first and if the surface is very rough, you’ll use more paint product than you would on a smooth surface. I, as a paint specialist, always figure my interior jobs at 300 to 325 per square feet a gallon. There’s nothing wrong with getting a little bit more than needed and taking unopened product back than being halfway though your job and run out. The best thing about my Ceiling Paint is that it dries to the touch in just 30 minutes. For best results, allow product to dry for four hours before recoating. 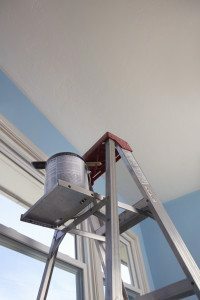 If you have additional questions about the product and process, contact Gateway FS Paint Department and we’ll take care of your ceiling. For a project quote on any outside or inside painting for the new year, call me, Brian Garleb, at 618.972.9516 or email me at bgarleb@gatewayfs.com. FS Construction Services is a division of Gateway FS, Inc.
Site built by Marketicity LLC.